I had this horrible nightmare last night, where I had given the wrong fabric requirements for the “Round the Year” Block of the Month I am hosting! In the morning, I checked, but all seems to be okay, except the requirement for 36″ background fabric which I increased to 3.5 metres from the more conservative 3.25 metres. I also saw a request on my blog for a downloadable file for the fabric requirement, which I think is a great idea. As there are at least two `official’ colourways, to avoid confusion, I am calling the blue- orange -yellow version “Dusk Round the Year” ! I am so fascinated by the wonderful colours that the setting sun paints across the skies – the brilliant oranges, golds and yellows – colours that can be rarely matched on canvas. Some may claim that sunrises are equally beautiful, but being a late riser I am rarely up in time to appreciate those. My quilt is, I hope, going to be evocative of languid monsoon evenings – grey clouds looming while the blues, more brilliant than ever after the rains, struggle to make their presence felt before the indigo darkness prevails! I do so ramble on, don’t I? So without much further ado, here is the Fabric Requirement -Round the Year – Dusk ! You will need Adobe Reader (available free online) on your laptop to be able to view this file. For those of you planning to make the `Rainbow’ version of the quilt, I hope to be able to post the requirements by tomorrow. 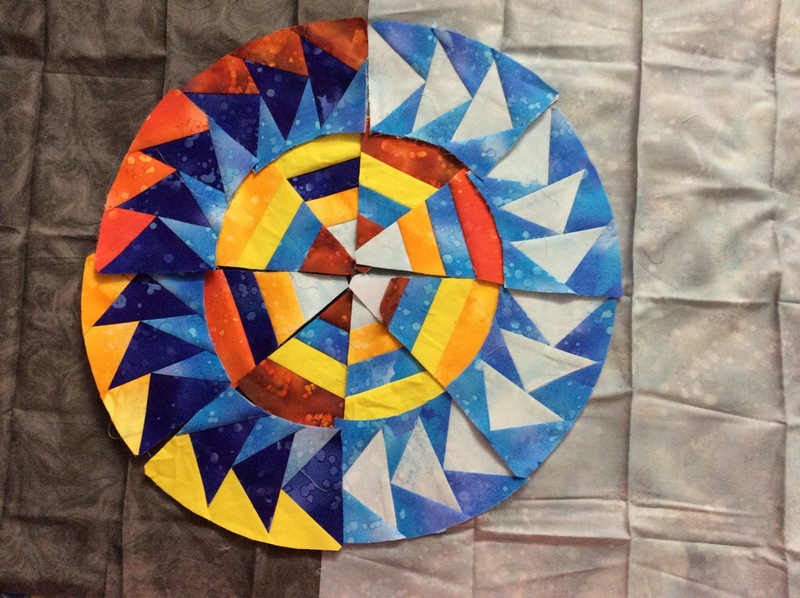 Sharing some fabulous quilts – enjoy, and be inspired! ** Double wedding ring I, a photo by Be*mused on Flickr. Something like this would look great as a miniature too! Another Dream – to make a Mariner’s Compass half this intricate. Japan Quilt Grand Prix Second Place, a photo by Be*mused on Flickr. Author MadsPosted on August 10, 2012 August 11, 2012 Format GalleryCategories For fun and for inspiration, Patchwork of my life, Plans for Another DayTags Awarded quilt, inspiration, Quilt1 Comment on Plans for Another Day?